Posted on 9, October 2018 by FactMR | This entry was posted in Automotive, Business, Electronics & Machinery, Germany, Industrial, Marketing, News, Transportation & Logistics and tagged Automotive Tow Bars, Automotive Tow Bars Innovation, Automotive Tow Bars Sales, Automotive Tow Bars Trends, Automotive Towing Brackets, Brink Automotive Tow Bars, Detachable Automotive Tow Bars, Europe Automotive Tow Bars Market, Fixed Automotive Tow Bars, Germany automotive tow bars market, Horizon Global Corporation Automotive Tow Bars, PCT Automotive Tow Bars, Retractable Automotive Tow Bars, Sudip Saha, Tow bars. Bookmark the permalink. DUBLIN 2, Ireland, 09-Oct-2018 — /EuropaWire/ — Increasing consumer pressure and broader sustainability trends are influencing automotive tow bars market players to adopt environment-friendly products, according to a new study by Fact.MR. The trend is especially pronounced in Europe, which accounts for nearly one-fourth revenue share of the market. The sustainability trend is well-complemented by growing consumer emphasis on ‘functionality without complexity’ as novel technologies, such as additive manufacturing and 3D printing witness growing adoption among market players. Fact.MR’s study finds that corrosion-protection tow bars are witnessing increasing penetration in Europe. In a bid to meet evolving consumer demand, tow bar manufacturers are experimenting with novel materials, with epoxy-based primers witnessing significant uptake. Considering consumer focus on sustainability and reducing carbon footprint, it is highly likely that waterborne lead- and tin-free formulations will gain ground among manufacturers in the near future. End-users in Europe are also placing increasing emphasis on fuel-efficiency and lightweighting, and its impact is palpable on the automotive tow bars market. Manufacturers are scouring lightweight materials for manufacturing tow bars that are lightweight and aesthetically-pleasing. Fact.MR’s study opines that automotive tow bar industry will mimic the broader trends in the automotive accessory landscape, and lightweight tow bars will become the norm rather than the exception. Fact.MR’s study on Automotive Tow Bars Market is comprehensive – 170 pages, 236 tables, and 78 figures. Know the methodology behind the report. 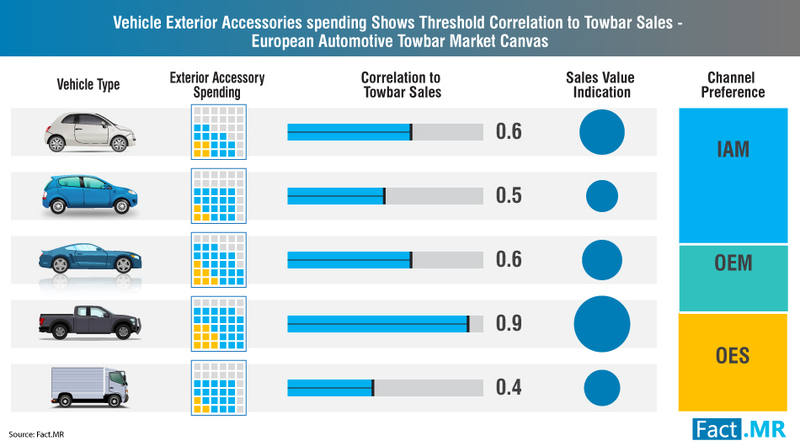 European consumers continue to show a marked preference for retractable tow bars, while once ubiquitous detachable variants continue to lose favor. Retractable automotive tow bars offer easy and safe operation, a critical parameter that influences buying behavior in Europe. The popularity of retractable automotive tow bars can also be attributed to the minute attention to vehicle aesthetics – a trend that has spawned growth in the wider automotive accessories landscape. Fact.MR’s report opines that retractable tow bars will continue to outsell detachable and other variants, including fixed and towing brackets. Independent aftermarket is a lucrative channel for automotive accessory sales in Europe. The popularity of IAM for automotive accessories also extends to automotive tow bars, owing to wider range and cost-effectiveness. Other competing sales channels for automotive tow bars include OEM and OES. The buoyancy in the aftermarket sales channel in Europe can be attributed to the steadily increasing CV parc in Germany and UK. The CV segment in Europe is witnessing a revival, as the impact of post-Brexit recovery kicks in. Fact.MR’s research finds that sales of automotive tow bars through independent aftermarket will surpass sales through OEMs in the near future. The automotive tow bar market in Europe continues to be on solid footing, and the long-term prospects remain bullish. Fact.MR’s study finds that a majority of sales remain concentrated in the triumvirate of Germany, UK, and France, with Germany at the forefront of sales in Europe. Germany maintains its position as one of the most prolific markets for automotive accessories. The country is home to nearly 50 OEM sites, and its vehicle and parts manufacturers employ over 800,000 people. Germany’s Westfalia-Automotive is considered one of the pioneers in automotive tow bar development and innovation. In 2016, it was acquired by Horizon Global Corporation. The acquisition of Westfalia-Automotive and Terwa made Horizon Global Corporation the leading manufacturer of towing and trailering equipment in Europe. 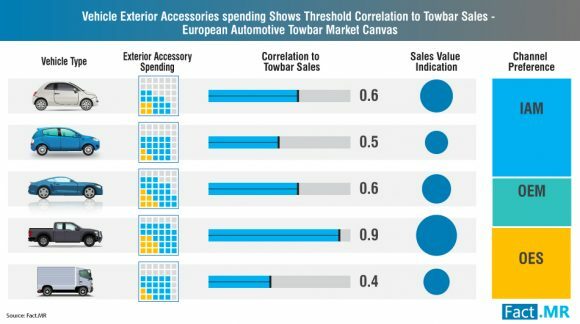 Despite the broader fragmentation in the automotive tow bars landscape, European manufacturers continue to hold sway. European companies, including but not limited to, Brink Group B.V. (Netherlands), Bosal International N.V. (Belgium), PCT Automotive (UK), GDW N.V. (Belgium), MVG Tow Bars (Germany), Auto-Hak Spółka Jawna (Poland), David Murphy Towing Brackets Ltd. (UK), and Dixon-Bate Ltd (UK) continue to be preeminent in the automotive tow bars market.